Systemic risk can be defined as the risk associated with the collapse or failure of a company, industry, financial institution or an entire economy. It is the risk of a major failureTax-Free ReorganizationTo qualify as a tax-free reorganization, a transaction must meet certain requirements, which vary greatly depending on the form of the transaction. of a financial system, whereby a crisis occurs when providers of capital, i.e., depositors, investors and capital markets, lose trust in the users of capital, i.e., banks, borrowers, leveraged investors, etc. or in a given medium of exchange (US dollar, Japanese yen, gold, etc.). It is inherent in a market system and hence unavoidable. The most important feature of systemic risk is that the risk spreads from unhealthy institutions to relatively healthier institutions through a transmission mechanism. The ripple effect resulting from systemic risk can bring down an economy. Controlling systemic risk is a major concern for regulators, particularly given that consolidation in the banking system has led to the creation of very large banks. Following the global crisis, financial regulators began to focus on making the banking system less vulnerable to economic shocks. They created firewalls to prevent damage from systemic risk. Regulators also developed prudent microeconomic and macroeconomic policies with increased emphasis on prudential regulation, putting in place safeguards for the stability of the financial system. Macro-prudential regulation seeks to safeguard banks or the financial system as a whole. Micro-prudential regulations involve the regulation of individual financial firms such as commercial banks, payday lenders, and insurance companies. The financial crisis began in 2007 with a crisis in the US subprime mortgage market. Eventually the bubble burst and there was a huge housing and mortgage bust in the US. This situation led to a liquidity and credit crunch that spread to all credit and financial markets. Both of these factors caused an economic panic that was not predicted to be so large. Economic panic led to an economy-wide recession in the US. Also, the US recession led to a steep decline in global and trade investments. This recession also affected the most advanced economies. Recessionary policiesQuantitative EasingQuantitative easing (printing money) is used by the central bank to alleviate economic underperformance and keep the economy from falling into recession further weighed down the banking system. The banking crisis resulted in a sovereign debt crisis and developed into a full-blown international banking crisis with the collapse of investment bank Lehman Brothers. Excessive risk-taking by Lehman Brothers and other banks helped to magnify the financial impact globally. 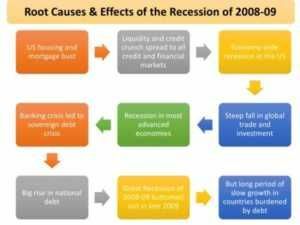 All these consequences led to worsening recession. The crisis was eventually followed by a global economic downturn, the Great Recession in 2008-09. The European debt crisis (a crisis in the banking system of the European countries using the euro) followed later. The recession bottomed out in late 2009, but there were still long periods of slow growth in countries burdened by debt due to the financial crisis. Risk diversification is the basis of insurance and investment. Thus, it is very important to study the effects that could limit risk diversification. One of the reasons is the existence of systemic risk that affects all policies at the same time. We here study a probabilistic approach to examine the consequences of its presence on the risk loading of the premium of a portfolio of insurance policies. This approach could be easily generalized for investment risk and the stock market. We can see that, even with a small probability of occurrence, systemic risk significantly reduces the benefits of diversification. Also, financial systems are especially vulnerable and even more causal to systemic risk than other sectors and components of the economy. There are multiple reasons for this reality. Banks tend to leverage up to the maximum amount, as seen in the structure of their balance sheets. The complex network of exposures among financial institutions creates a significant threat that the surviving banks will lose part or all of their investment along with the collapsing bank. And, if such a failure takes place suddenly or unexpectedly, there could be losses massive enough to threaten or take down the responding banks. Financial risk managers and regulators can also find the inter-temporal aspect of financial contracts as a challenge of managing systemic risk. Systemic risk management can be done by regional, national, or even global efforts. Since systemic risk can take down all or part of an economy, financial risk managers can access regulatory tools and legally binding recourse to manage threats within an economy. For financial institution regulators, this includes the authority to examine equity returns, debt-risk premiums, deposit flows, and other exposures. The omnipresence of correlated assets and the way capital can move across sovereign borders, however, increases the risk of systemic contagion across the global system. You can further explore investment and economic risk by looking at the following resources from CFI.